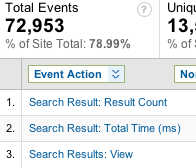 Event Tracking in Google Analytics is a way of injecting custom data to be stored for analysis later. We have implemented an integration with Events Tracking that will let you track more easily what users are doing in your directory. Like any web analytics you will need to have it running on your site for a while to get meaningful results. If you have Google Analytics on your Tribalogic website it should be working for you automatically. 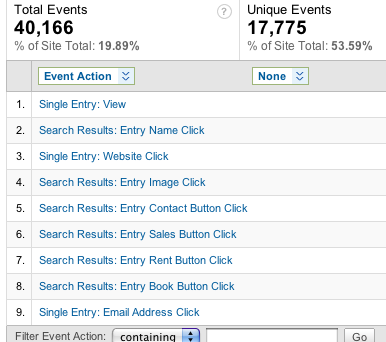 Log into Google Analytics Look under Content » Event Tracking. Can I track other things? It depends how you have structured your listings and full info pages what is best for you - just ask and we can add in what is appropriate. The Tribalogic platform allows administrators to bundle entries up into groups. Groups are usually indications of ownership and allow an group manager to log in to update their entries (e.g. add photos or descriptions). In Event Tracking, we allow you to look at how a group is performing against other groups - very useful for keeping larger your customers happy!